Merseyside is blue. The Reds are still blue over Saturday’s loss to West Brom, the Blues are celebrating their 1-nil win over Manchester United, and Former Toffee John Ebbrell is head of Academy Coaching at Transmere Rovers. I’ll be honest, I didn’t know anything about John Ebbrell prior to 9:47pm EST. 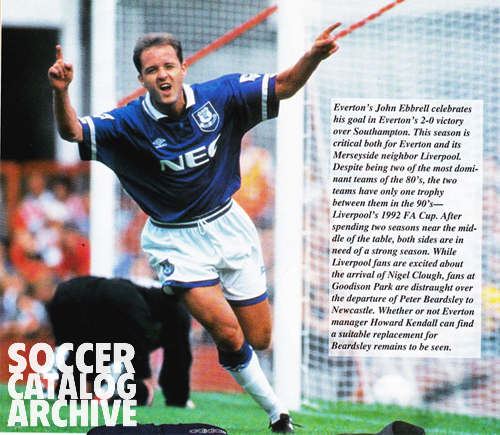 After finding Everton midfielder on page 46 of the Winter 1993/94 Eurosport, I can tell you that a) his job title is more badass on Wikipedia than it is on the Transmere Rovers site (“Centre of Excellence Manager” vs “Head of Academy Coaching”), I can tell you he made over 200 appearances for Everton between 1986 and 1997, and I can tell you how he was forced to retire due to an infection he picked up in an hospital while have a procedure done on his ankle. Everton’s John Ebbrell celebrates his goal in Everton’s 2-0 victory over Southhampton. This season is critical both for Everton and its Merseyside neighbor Liverpool. Despite being two of the most dominant teams of the 80’s, the two teams have only one tropy between them in the 90’s —Liverpool’s 1992 FA Cup. After spending two seasons neaer the middle of the table, both sides are in need of a strong season. While Liverpool fans are excited about the arrival of Nigel Clough, fans at Goodison Park are distraught over the departure of Peter Beardsley to Newcastle. Whether or not Everton manager Howard Kendall can find a suitable replacement for Beardsley remains to be seen. Losing 3 nil to West Brom on the opening day of the season? Definitely tough to take…especially considering how Liverpool finished last year…things could only get better, right? RIGHT?! As a Liverpool supporter, I’d give anything to see some smiles at Anfield next Sunday against City. I found this in the Winter 1992/93 Eurosport. Rushie, Deano Saunders, and a young, baby faced Macca. Last year’s F.A. Cup was a happier time for Liverpool striker Dean Saunders. Brought to Liverpool’s Anfield Road for a record fee, Saunders was tranferred this season to midland side Aston Villa. 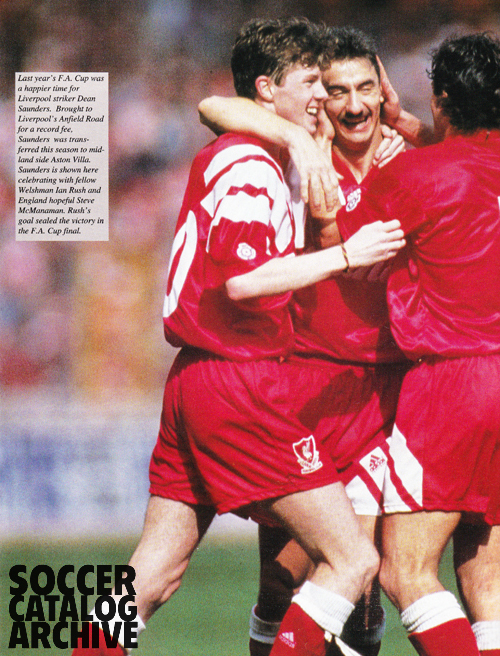 Saunders is shown here celebrating with fellow Welshman Ian Rush and England hopeful Steve McManaman. Rush’s goal sealed the victory in the F.A. Cup final. Expensive striker moved on to another club after a year? …Doesn’t sound familiar.